Boxes are essential for your move (I mean, who won’t have to use boxes when moving?). We all live in a world where getting new materials, gadgets, and items for your home is as easy as it can ever be. Most times, we don’t know how much we actually have until we have to move. Moving boxes make moving easier by reducing your workload and ensuring that you have fewer trips to take when moving. As opposed to having to take your items in one by one you can just pack several items and put them into boxes. Moving is easier, and you can keep things better organized that way. One of the easiest ways to move your things is to have them placed in boxes. However, another way to make this even easier is to have them labeled. 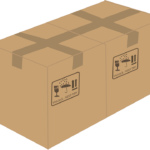 Basically, you can have related items in one box and put labels on them in order to make your process of unloading much easier. You can put every award you’ve ever won in a separate box and have the box labeled “awards and plaques”. This way, you (and your movers as well) will be able to know what is concealed inside the box when it’s time to move and unload. If you have to move things that are very delicate, then bubble cushioning wrap is essential. Basically, you can put things inside bubble cushioning wrap and it will be able to form a protective coating that will prevent shock from having an effect on fragile items. It is especially useful if you’re moving over a far distance and the ride to your new place can be a long duration. With bubble cushioning wrap, you know that your breakable items are protected. The purpose of tape for moving is quite extensive; it can help to seal the boxes so as to make sure that the constituents of those boxes don’t end up spilling or identify room destination with colored room labeled tape. While moving, it is not entirely impossible for certain things to get broken. If they do (and they’re mendable), it will definitely help for you to have some glue to help put them together. Scissors will come in handy when you need to open sealed boxes that are on their way to your new place or any other packaged supplies that you purchase along the way.